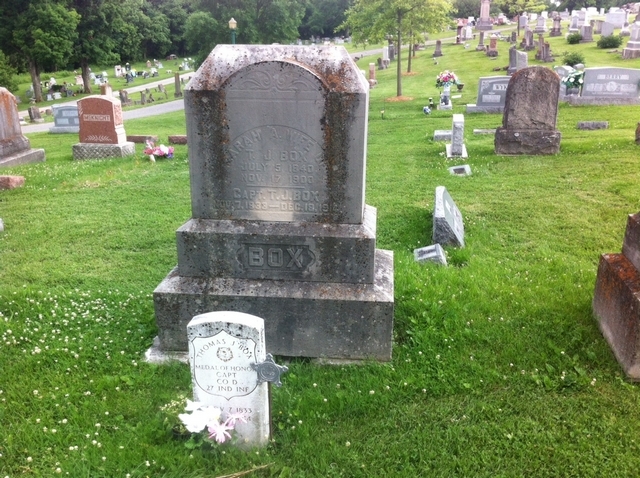 Thomas Box was an early Sherriff of Lawrence County. During the Civil War, he served as a Captain in the Union Army in Company D, 27th Indiana Infantry and later was part of the Union Army of Shenandoah. Thomas was awarded the Congressional Medal of Honor for action on May 14, 1864 at Resaca, Georgia. His citation reads "Capture of flag of the 38th Alabama Infantry (Confederate States Army)." He is Lawrence County's only Congressional Medal of Honor winner.